There are several versions of this anecdote. In some the two monks were from a Catholic monastery in Wallachia or wandering Catholic monks from a foreign land. In either case Dracula would view Catholic monks as representatives of a foreign power. In other versions of the story the monks were from a Romanian Orthodox establishment (the native church of Wallachia). Dracula’s motivation also varies considerably among the different versions of the story. All versions of the story agree that two monks visited Dracula in his palace at Tirgoviste. 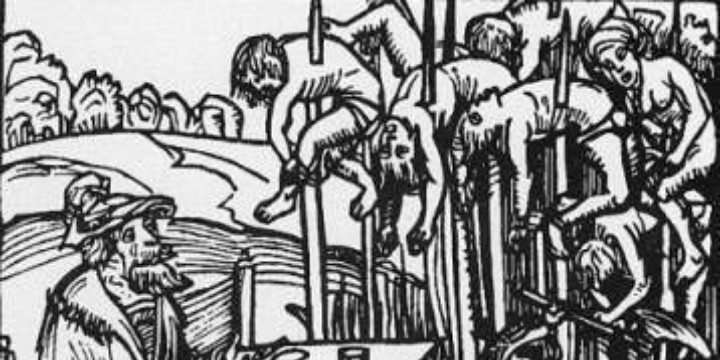 Curious to see the reaction of the churchmen, Dracula showed them the rows of impaled corpses in the courtyard. When asked their opinions of his actions by the prince, one of the monks responded, ‘You are appointed by God to punish evil- doers.’ The other monk had the moral courage to condemn the cruel prince. In the version of the story most common in the German pamphlets, Dracula rewarded the sycophantic monk and impaled the honest monk. In the version found in the Russian pamphlets and in the Romanian verbal tradition Dracula rewarded the honest monk for his integrity and courage and impaled the sycophant for his dishonesty.